Youth-Vote 2015 (YV2015) campaign is now fully on course! YV2015 campaign has one ultimate goal: to increase the electoral participation of all eligible Nigerians of voting age, especially young voters in the 2015 elections. A significant number of young voters go to the polls without the necessary tools to make an informed decision. They know little or nothing about the politicians and have no idea how the political institutions that run the country function. 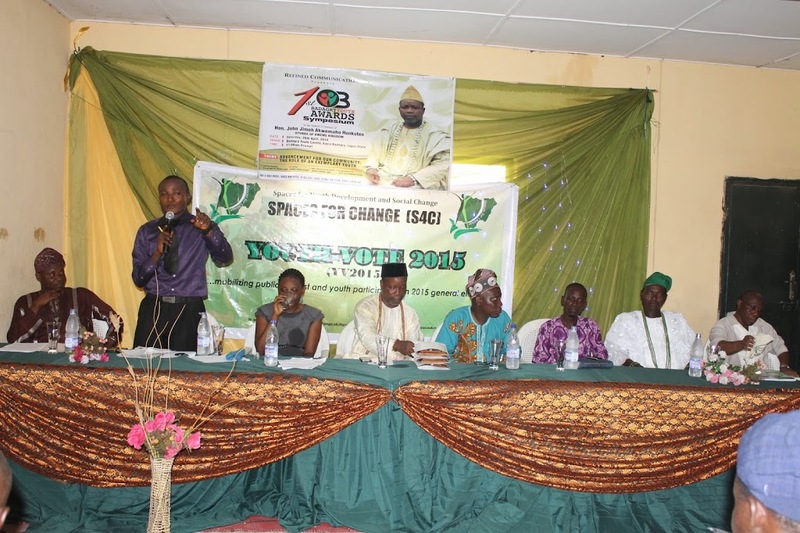 Thanks to YV2015, Badagry communities in Lagos will never remain the same again. On Saturday, May 26, 2014, traditional rulers, grassroot politicians, religious groups, women and youth leaders of various communities and villages in Badagry Local Government benefited from empowering YV2015 civic education and election simulation exercises remarkably delivered by Spaces for Change’s YV2015 advocates, Oluwafunmilayo Fakeye and Cletus Ogwuche. Located on the outskirts of Lagos, close to Seme borderline which exits to other West African countries, Badagry indigenes and residents hardly benefit from political empowerment and public enlightenment initiatives designed to educate citizens and facilitate local participation in envisioning and shaping outcomes on political, social and economic matters that concern them. Residents and indigenes only see political aspirants during election season, when they come to share soaps, bags of rice and make promises they are not prepared to fulfill. The confidence to engage returning and aspiring political aspirants and hold them accountable to their campaign promises was profoundly lacking. Helped by YV2015 timely intervention, all that is about to change. The Badagry traditional ruler, Hon. John Jimoh Akwemaho Hunkuten, the Otunba of Kweme kingdom could not hide his joy. For the first time, he is taking part in a strategic civic education activity specifically tailored to deepen youth and community understanding of the electoral procedures, especially the recent mechanisms introduced by the Independent National Electoral Commission (INEC) to improve the quality of poll outcomes in the 2015 general elections. Speaking in their local Yoruba language, YV2015 advocates delivered basic information about the voter registration requirements, the voters’ register, voters’ verification exercise, voter registration transfers, the Automated Fingerprint Identification System (AFIS), the consequences of multiple registrations and the delineation of polling units in Badagry Local Government Area. The participants and elders of Badagry communities such as Dr. T.S. Nurudeen, Director of Annex Programmes Lagos State Polytechnic, Dr Seriki Abimbola, Medical practitioner at Badagry General Hospital disclosed that they have never heard about the latest improvements in the electoral processes before. Nearly everyone present in the meeting room admitted they haven’t heard about AFIS and the voter registration transfer processes, and as such, did not know how to access or navigate those INEC mechanisms. Casual role plays and simulation exercises were staged to deepen their understanding of the new electoral provisions and measures for avoiding disenfranchisement. Women leaders were particularly urged to break away from the culture of silence by heightening their visibility in social, economic and political decision making processes at all levels of government. YV2015 is a bridging campaign that purposefully links online advocates with offline communities, delivering civic education and mobilizing every eligible voter to REGISTER, ENGAGE POLITICAL ASPIRANTS & VOTE during the 2015 elections. It facilitates voter-politician engagement on critical social and economic promises and development agenda laid out in the manifestoes of political parties. It strategically deploys robust online engagement and uniquely-crafted offline activities in order to imbue young voters with the confidence to directly engage political office aspirants and ask them questions that matter to them: how they will create jobs, tackle corruption in the oil sector, improve learning infrastructure and educational standards, and evaluate their blueprint for bringing about developmental and economic progress to Nigerians. YV2015 matches the robust campaign in online spaces with offline action, by taking civic education directly to remote communities without access to the internet, and other constituencies not likely to be reached by traditional voter outreach methods. “I feel like renaming this Badagry Youth Center to Spaces for Change Youth Center. S4C has indeed, created powerful spaces that can bring change to this community”, the excited Hon. John Jimoh Akwemaho Hunkuten, the Otunba of Kweme kingdom said. Handing over an exemplary leadership award to the organization’s executive director, Ms. Victoria Ibezim-Ohaeri, he pleaded that such capacity-building initiatives should be replicated across Badagry communities before the elections start. “I want every member of this community to have the same information we have had today. No one should be left behind”, he stressed. YV2015 campaign takes broad and effective action needed to address the issue of youth voter engagement. It forms part of a broader campaign to deepen democratic participation, while ensuring that the 2015 election campaigns of the various parties remain issue-driven, citizen-focused and reflects the priorities of Nigerian youths. With this campaign, Nigerian youth are determined to say: No more apathy.No more dulling.This is our time!